Early Black Friday Event Regent Seven Seas - Fugazi Travel Agency Inc.
​Our Upgrade & Indulge Black Friday Event begins on Friday, November 16.
to Europe, Alaska and the Caribbean. 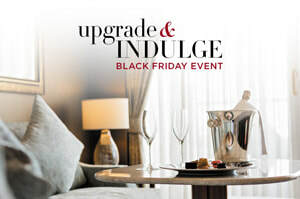 Our Upgrade & Indulge Black Friday Event begins on Friday, November 16. Mention promo code INDULGE at the time of booking. *For full pricing Terms and Conditions and Guest Ticket Contract, visit RSSC.com/legal. Offer is capacity-controlled and applies to new bookings only made between 11/16/18 and 11/30/18. Offer is combinable with standard published promotional offers and National Account Amenities, however, is not combinable with Canadian Dollars at Par, Single Supplement Specials or Group Pricing, though offer is combinable with group amenities and will count toward TC. On the June 25, July 2 and July 12, 2019 voyages aboard Seven Seas Explorer®, guests will receive a 2-category suite upgrade; book a Category H Suite and receive a Category G1 Suite, or book a Category G2 Suite and get a Category F2 Suite, or book a Category G1 Suite and get a Category F1 Suite, or book a Category F2 Suite and get a Category E Suite, or book a Category F1 Suite and get a Category D Suite, or book a Category E Suite and Get a Category C Suite, or book a Category D Suite and receive a Category B Suite, or book a Category C Suite and get a Category A Suite. On the April 5, April 26, May 4, May 14, May 24, July 2, July 29, August 9, August 19 and August 29, 2019 voyages aboard Seven Seas Voyager®, guests will receive a 3-category suite upgrade; book a Category H Suite and receive a Category E Suite, or book a Category G Suite and receive a Category D Suite, or book a Category F Suite and receive a Category C Suite, or book a Category E Suite and receive a Category B Suite, or book a Category D Suite and get a Category A Suite. On the January 17, January 27, February 13 and March 22, 2019 voyages aboard Seven Seas Voyager®, guests will receive a 2-category suite upgrade; book a Category H Suite and receive a Category F Suite, or book a Category G Suite and receive a Category E Suite, or book a Category F Suite and receive a Category D Suite, book a Category E Suite and receive a Category C Suite, or book a Category D Suite and receive a Category B Suite, or book a Category C Suite and receive a Category A Suite. On the February 23, 2019 voyage aboard Seven Seas Voyager®, guests will receive a 2-category suite upgrade; book a Category H Suite and receive a Category F Suite, or book a Category G Suite and receive a Category E Suite, or book a Category F Suite and receive a Category D Suite. On the May 26, June 5, June 12, July 3, July 12, July 24, July 21, August 7, August 14, August 21, August 28, September 4, September 11, and September 18, 2019 voyages aboard Seven Seas Mariner®, guests will receive a 2-category suite upgrade; book a Category H Suite and receive a Category F Suite, or book a Category G Suite and receive a Category E Suite, or book a Category F Suite and receive a Category D Suite, or book a Category E Suite and receive a Category C Suite, or book a Category D Suite and receive a Category B Suite, or book a Category C Suite and get a Category A Suite. Offer may be withdrawn at any time without prior notice. Mention “INDULGE” at time of booking.